For a heavy woman, I have oddly slender and agile fingers. These help when I pick out Chopin’s mazurkas. I play him as a gift to myself, he turns my guts to vapour. Today I play Opus 33, and the first part, as always, makes me rise above myself, like a revenant. ‘Your playing is muddy, Agatha,’ Mulgrew says, tramping across the floorboards with that intrusive gait of his. ‘And your mouth turns down unattractively when you’re at the piano.’ A familiar refrain. I switch to Schumann, slow and mellow, and very swiftly begin to enjoy the music’s dense heart. Schumann doesn’t work on me like Chopin, rather he opens me wide, wires me into what is outside my body: the piano stool hard under my buttocks; the house martins that swing and scream past the window; the blackbird chiming in. Everything without and below my room. Mulgrew withdraws to the fireplace, stares into the flames and shuffles disapproval with his feet. I turn back to Chopin – a nocturne, with a glorious swell of rippling notes; I know that Mulgrew loves the flourishes of this piece. I also know that I no longer love him. The birds continue their raucous accompaniment and I tilt my face, the better to see them. 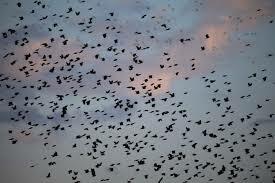 How they scurry through the sky, how unburdened they are. Their upsurge is seductive, the startling plunges they take, the sound of their song. I launch forward and out I go. Schumann drums through me, makes me buoyant. On I go, air-kept and light. Music rises and rushes, past and within me. The house martins chime their approval, the blackbird too. Down, down I drop until I hit ground. There I sprawl, broken but whole, singular as a feather fallen from the sky.